I have MANY OCD’s….welcome to my world! I AM Debbie- I AM married, my husband-Karl/one TEEN-AGE daughter-Kyla/and one TEEN-AGE bonus-son/Kyle. My home, Cross Point Community Church-the ONE and ONLY! 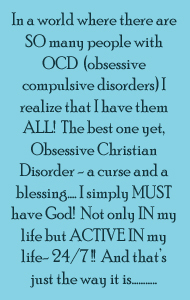 I TRY my best to live as God wants me to, every single day-but I do have OCD, so bear with me at times, God does! L-I-F-E……. don’t take it for granted. Country Music Marathon – 2010…DOWN THE DRAIN! Merry Christmas…. to Y – O – U !!!!! LASTLY…. I ALWAYS go back to get Lori and help her finish strong!!! Good job! I ride bike – averaged 8 miles a day in September – my knee’s won’t let me jog.